According to the Bureau of Labor statistics, the more highly educated not only earn more, but have higher rates of employment. Even skill building and adding a certificate can boost earnings. Coursera offers free courses on-line from world renowned professors. In fact, I received an email this morning from Zvi Bodie, MIT educated, Boston University distinguished professor, and world renowned author about their latest offerings in the finance area. Coursera has caught the attention of the legitimate academic world. 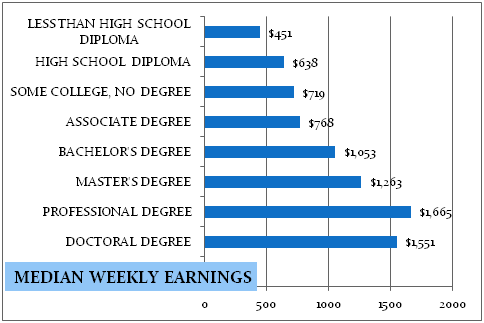 The chart demonstrates how even an Associate’s degree increases your annual earnings $6,760 over that of a high school graduate. 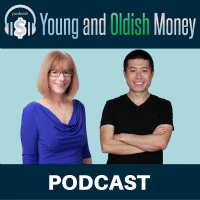 Compound the additional $6,760 each year (and adjust for 3% inflation) and over a 40 year lifetime that money grows to $487,661. Graduate from college and your annual earnings soars $21,580 over those of your high school educated neighbor. With college costs increasing faster than the rate of inflation, any available method to obtain free education is a huge financial windfall. Add well respected institutions and highly regarded professors to the mix and you have a wealth building opportunity. Coursera is changing the face of education and lowering the cost as well. They are beginning a collaboration with American Council on Education (ACE) to initiate a process for their students to receive transferable credit. That means a student can take a free class at Coursera, take an exam, and qualify for transferable credit (for a small fee). Imagine taking courses from world class professors and transferring the credits to degree granting institutions. What a creative way to increase your knowledge base and cut down on educational expenses. Although I talk a lot about wealth building, there is another type of capital to consider; human capital. That’s the value today of all of your future earnings. 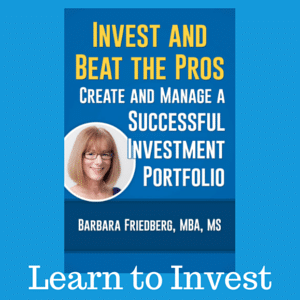 Although you can’t bank it immediately, that intangible sum is what creates your future wealth. Take steps today to boost your lifetime earnings, and you gift yourself with a more prosperous life. That’s where skill and education boosting comes in. By broadening your skill and educational base you increase your future earnings and your human capital. The 60 free Coursera Courses this winter range from Professor Ed Hess’s “Grow to Greatness: Growth for Private Business” from UVA, to the beautifully designed “Calculus: Single Variable” with Professor Ghrist from the University of Pennsylvania, to “Introductory Philosophy” from University of Edinburgh, to “The Fundamentals of Personal Finance Planning” from UC Irvine with Professor Debok, and many more. Find a reason to learn more. 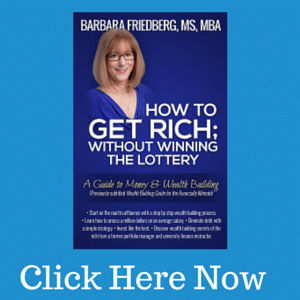 It will increase your confidence and your pocketbook. Have you ever taken a course online? What worked and what didn’t? My dad gave me this advice when I was in high school. I didn’t realise it at the time, but this was possibly the best financial advice I have ever received. Getting my degree has allowed me to eclipse the earning potential of many of my non university educated high school peers. I have taken courses with CourseRA they are REALLY good. The only draw back is employers will not accept it as “formal” education. In that aspect I think it may be a failing venture. Not to take away from what they’re doing because it’s unprecedented and a step in the right direction. However, I cannot sit in and take certain financial exams because I do not have the “accredited” college hours, even though I know the material through and through. Hi Marvin, It seems as though they are attempting to remedy that problem by partnering with ACE to allow students to test for credit. I agree that is important for those that need the “formal” course acknowledgement. Thanks for sharing your experience. I’m definitely going to look into how much the ACE fees are. It would be fantastic to take an exam and receive credit!!! Thanks for this article. @Marvin, Please write in and let us in on the process. Thank you. With escalating fees, this is the way that a lot of university education will be delivered in the future, and not only for technical subjects like electronics or banking. Coventry University here in the UK (not one of the better known institutions) has developed a course in photographic tuition called #phonar. This has attracted students from around the world. And to reduce it to the crude basics, the creative arts are very good money earners for nations. I’ve never taken a course online, except quick one or two day courses while working (these were simple customer service, asset allocation or life insurance classes). Although I enjoyed the ease of taking the coursework this way, I found there were too many distractions at my desk. When the class got boring, I’d find myself looking around for a book to “glance through” until they got to a part that interested me. Oh, I just saw the Stanford classes there, nevermind. Wow, this is a cool site! I went back to get my credential so I could pursue a full-time teaching job. Though it hasn’t paid off yet, I’m confident it will within the next couple of years as the job market improves. Investing in my own human capital is something I am actually good at. @Little House-Investing in one’s education is bound to pay off. Like all events, it may take awhile, but as you stated, in the long term you will benefit. The chart is pretty clear regarding income and eduction. I believe that between secondary and university there must be more than $1 million in difference over a lifetime! Kevin, The differences are quite substanntial. A few years of education translates to an increase of nearly a million dollars in lifetime earnings, as you mentioned. I would not dispute the stats in the chart above. But the question that I have is what is the distribution across the board. By that I mean this. What if a small percentage of every 100 college grads makes the majority of the money. One hundred college grads together may earn five million dollars a year but to get a better picture of things you must break it down further. If just twenty grads earn an average of one hundred twentyfive thousand dollars a year that would mean twenty grads would earn as much money as the other eighty grads combined. The average of the other eighty grads would be only thirtyone thousand dollars. I would also like to say I have nothing against improving yourself through formal education for some things its neccessary to learn through formal education. Where I really disagree is with all this credentialing based on these different degrees high school bachelors masters doctorate we have created a class structure based on these different degrees. Learning can take place in many different ways and forms besides just through formal education. How many folks are their out their that have a vast amount of knowledge about a wide aray of topics but they will not get credit for what they have learned because they do not have any formal education transcripts to prove they have acquired the knowledge that they have. I have had a computer for almost three years. When I bought it I did not know how to type I was a terrible speller. I have come a long way in less than three years. I can type and spell pretty good on my computer today. I taught myself to type on the computer. I learned how to use the computer by myself I did not take any lessons or anything like that. I agree that the traditional college experience is changing (and should) with technology. I haven’t taken an online course, but would love to look into it when I have free time. Great Information. Bookmarked the content.